Director: William K.L. Dickson, who also appears as the violin player. Twitter Capsule: Early cinematic technical ambition fused to becalmed tenderness among men, in year of Wilde's trial. VOR: ⑤ Path-breaking stab at conjoined image and sound would alone make it priceless. The striking overtones of the tableau make it only more so. It's just delicious that the earliest surviving attempt to simultaneously record a moving image and live sound is also a document of two men dancing as a couple. Maybe it's too delicious, insofar as scholars of LGBT cinema from Vito Russo onward have been eager to claim the Dickson Experimental Sound Film as a proto-avatar of gay cinema, or of cinema's history as itself ineradicably gay, on the evidence of this 14-second fragment. I more than understand that pull; I'm susceptible to it myself, even as I recognize the conceptual cheating it involves. In historical context, the spectacle of two men taking a turn to an excerpted tune from the cabin boy's barcarole in Robert Planquette's opera The Chimes of Normandy does not connote desire, much less "homosexuality"itself a barely incipient term in English parlance in 1895, the year of Oscar Wilde's paradigm-shifting trial for gross indecency. All-male dances were, as the kids say today, A Thing in the 1890s. They were not explicitly sexualized. As a now-archaic phenomenon, they're at the root of the scrumptious Oscar-winning short film Ray's Male Heterosexual Dance Hall. But I'm not trying to ruin anybody's good time, and to me, it's sufficiently startling and invigorating to behold untroubled masculine tenderness engrained in the proteins of cinemathat nascent marriage of art and science, and eventually of spectacle and sonorityas even if it's not quite "proof" of homosexual togetherness. The desire for LGBT people to know that We've Always Been Here is strong, as is the appetite to know we've never been shy of the camera or missing from the screen. So, too, is my desire to know that gender and, in particular, masculinity haven't always been saturated with panic. I relish the recognition that 1895, that pivotal acceleration-point in Anglo culture's compulsion to classify people as eroticized "types" (the female hysteric as well as the homosexual man) also yielded this ephemeral but striking impression of men apparently untroubled by stigmatic threats, men more interested in what they were creating than in how they would be seen. They aren't boxing or lifting barbells, like many of the male subjects in moving images of the 1890s. Creatively speaking, their activity suggests the Dickson team's privileged investment in sonic conundrums over visual delights: the camera isn't looking for motion as kinetic as you'd find in the heavyweight ring, or seeking details as fine-grained as you could scrutinize (and often did) in a bodybuilder's flexing musculature. But the choice of a dance also suggests that people's intimacy and ease with each other can be as transfixing to witness as their amped-up conflicts or most flamboyant displays. And all that said, it is a little gay, and I love that, too. The dating of the footage is, in fact, uncertain. Film preservationist Patrick Loughney, speaking about the Dickson Experimental Sound Film on Kino Video's prodigious DVD box-set Edison: The Invention of the Movies, places its production anywhere between October 1894 and April 1895, and no record of any public exhibition exists. If it's hard to draw a straight line (as it were) from this image to the Stonewall riots in 1969, it's just as hard to link it directly to The Jazz Singer in 1927. 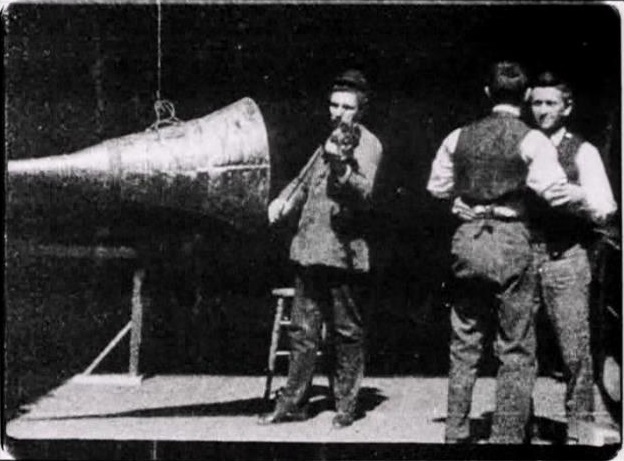 Yes, image and sound were recorded simultaneouslyyou're watching Dickson himself play the violin into a giant recording horn while his two co-workers move with the melodybut integrated capture wasn't the conceivable goal. The music was engraved onto a wax cylinder while the image was burned into photosensitive film, so they were not even consigned to the same material base. In the restored version of this film that Walter Murch and Rick Schmidlin co-supervised over a century later, the bow's movements still don't fully match the audible notes, so synchronicity as we currently conceive it was neither realized nor, most likely, strictly pursued. The Dickson film is a gesture toward a dream of total, synaesthetic confluence that even these ambitious pioneers must have known was some way off. Again, if anything, I'm more susceptible to this record of asymptotic approach and elusive aspiration than to the apocryphal scenario of a "first," fully executed sound film. Cinema for me is always about future-oriented striving at least as much as it's about existing product or an empirically documented pasts. Beyond the intertwining of image and sound, the union I perceive here joins the actual, incredible achievement of these technicians to the virtual imprint of what they are working toward, what they imagine.